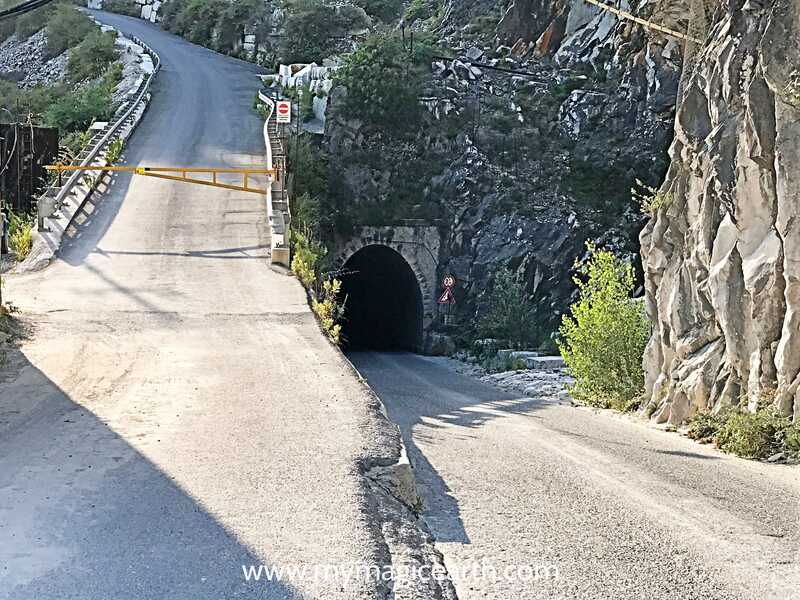 The Marble Route near Carrara (northern Tuscany) passes through the marble mountains, tunnels, a local village built for marble diggers, and archaeological sites. Along the marble route, one can see marble quarries and drive on the winding roads that lead to them. Those marble quarries were made even more famous by the film “007 Quantum of Solace“, starring Daniel Craig and directed by Marc Forster. Some of the film’s most memorable scenes were shot there, including a car chase in the famous James Bond Aston Martin. There are many marble tours on the markets, for example, the exclusive marble cave jeep adventure tour. We have seen several tours on the way while we drove around the route. Because we came with the idea to visit the area during our Tuscany trip, we were unable to book one on site. Therefore, we made a self-driving through the following marble route. We started from Carrara Old Town then took the Via Codena. The road leads to the Colonnata Valley. After about 2500 metres we entered into Codena. Once we exited the village, we had a gorgeous view of the marble mountains. We drove further towards Colonnata and then passed through Bedizzano. After about 1km there is a panorama viewpoint called “La Piana”. There is also a marble souvenir store which offers many amazing marble products, such as chopping board and chess boards. I couldn’t resist the beautiful products and bought one a blue marble bracelet for 8 Euro. Well, the owner confirmed to me that the blue colour was natural. Keep driving the same route for another 1500 metres we found a big marble block that shows the direction to an archaeological site. It is said that marble was extracted probably even before the Roman times. Since the 5th century B.C., it was used to built monuments, buildings, and works of art. The site shows how Roman used some very simple tools to dig marbles. On some semi-finished marble blocks bear descriptions, the so-called “marchi di cava” (quarry marks). These are short texts linked to marble extraction activity. The quarry marks include the ownership of the block, the sector of the quarry where the block had been extracted or the name of the foreman in charge of the extraction activity. We had to go back to the main road where the souvenir shop is. Continued following the road sign to Colonnata, in about 10 minutes we reached Colonnata. Colonnata is a hamlet of the comune of Carrara. It was probably the oldest settlement in the area during the Roman time. 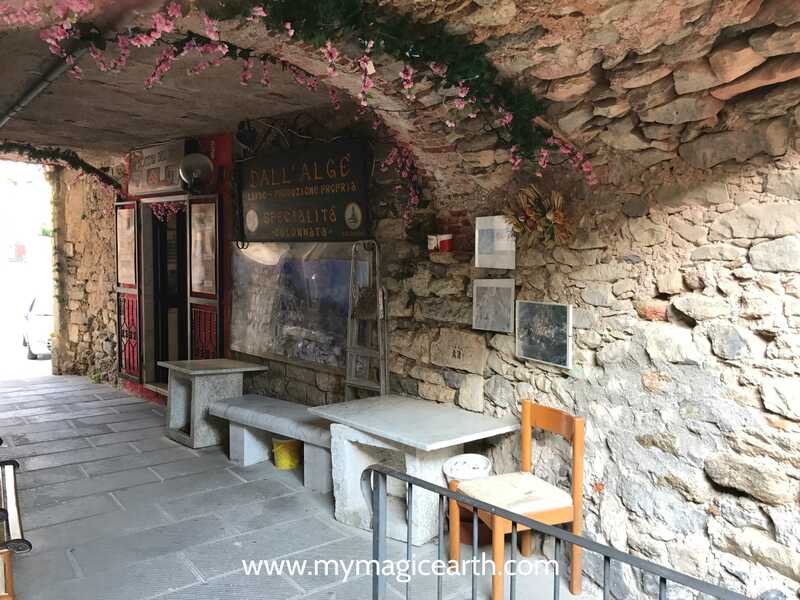 The village has well-kept some marble features, such as the use of marble in murals, doorways, doorjambs, windows and other architectural features. The village is also known for the Colonnata lard, a type of cured pork fat. One can buy the product in the local shops. The village is a good stopover for our marble journey. From Colonnata we descended along the same route to the first road crossing, then turned right towards the place called Tarnone. From Tarnone we took the tunnel which was once used for the marble railroad. The tunnels are all in one-way. Here we started to experience the 007 movie scenes. On the way, we caught views over the villages of Bedizzano and Codena. After about 1km is the Vara Bridge. This is another view point of the marble mountains. From Vara Bridge, we turned right and drive uphill to Fantiscritti. There is a big parking lot, toilets and an open-air exhibition. In the exhibition, there are machines and tools used over the 2000 years of excavation and transportation of marble. To get back to Carrara we needed to drive downhill again. At Vara Bridge we turned right and drove through another tunnel which was illuminated. On the way, there is still a chance to enjoy the view of Carrara from the mountain all the way to the sea. After the tunnel, there is a sign pointing to Carrara. From the sign, it is 2km driving to the Carrara historical town centre. Based on our experience, it is quite difficult to follow the marble route without a guide. Some places are not well sign-posted. Besides, an off-road car is recommended because some places are unpaved. Although we made a self-driving tour following the entire Marble Route described above, I would recommend booking a tour instead. There are many guided off-road tours. Check out this exclusive marble cave jeep adventure tour, if you want to have an inside of the marble culture and industry. It may provide the chances to visit a working quarry. If you are having a holiday in Viareggio, you can join this tour, Carrara Marble Tour Small Group from Viareggio. Wow. Marble Caves and tour looks so interesting. Definitely going on my list of places I want to go.